With the world economy unstable and dairy prices reduced in many Australian areas recently, farmers are looking for equipment that offers value for money and the best possible levels of productivity, says Case IH Marketing Manager Stuart Brown. "The days of one machine for one job are gone. Dairy farmers only want one machine, but they want it to be suited to a wide range of tasks. Case IH offers a big range of tractors in overlapping horsepower brackets so that, for instance, a farmer can choose a heavier product for hilly land or a lighter machine for a flatter property. "Case IH offers a range of products, including JXU and Puma tractors, designed to move from one job to the next with ease, ensuring they're in productive use no matter what task is at hand. A product that is suited to more than one task delivers a greater return on investment." Stuart says the new Puma tractor, with increased horsepower for hauling heavy silage carts and easy adaptability for different implements, is ideal for the dairy industry. "The latest models of this versatile tractor offer an Automatic Productivity Management (APM) system for maximum fuel savings and an exclusive hydraulic power boost. There's also active stop control, perfect for working on sloping land; and a host of features to improve operator ease and comfort, from the multi-control armrest to the cab A-post instrument cluster. The new 125 model and the 140 model are particularly suited to the hay segment, offering the weight required for applications like moving large square bales in a basic tractor that's easy to operate. The Puma CVT, to arrive in Australia in mid-2009, is also ideal for the hay segment. "The range will make Continuously Variable Transmission available in machines from 180 to 225 hp. It's a great transmission option for the hay sector as it allows the operator greater control over the forward speed," Stuart says. The rugged but economical 4.5 L JXU tractors also offer the versatility dairy operations require. "The JXU is more economical both in terms of purchase price and ongoing operation than some semi-powershift tractors in the same horsepower range, but they still offer the versatility and grit that farmers want." The three models are available in a range of specifications to suit different operations and a choice of either ROPS or cab version. "Our design makes it easier for operators to get the job done, with features like clutchless on-the-move gear shifting through eight speeds thanks to the right thumb switch mounted on the speed lever. The JXU range is also designed to match perfectly with the VISION-LIFT 40 front end loader. The VISION-LIFT 40 is one of six new models in that range, and there are also two new models in the PRIME-LIFT loader range. "The loaders are very operator friendly, with a uniquely designed loader self-levelling system that significantly increases visibility," Stuart says. "They also have a new Auto Cam Lock & Fast Lock frame stand system which makes it quicker and easier to detach and reattach the front end loader to the tractor." Case IH will also launch two new baler ranges this year. The RB 4 series round balers (with two new models, the RB 454 and RB 464) come with a rotor feeder and an optional rotor cutter. "Rotor cutting before baling makes for easier spreading later and the shorter crop lengths are easier for ruminant animals to digest," Stuart says. The new LB 3 Series large square balers (also with two new models, the LB 333 and LB 433) will also be released shortly. 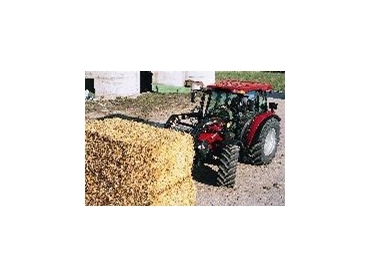 "These balers are ideal for hay contractors and large hay producers. The new models include an improved mechanism for stuffing and faster turnaround time for ejecting the previously formed bale."